Update April 15, 2012. The tree that I purchased in early 2011 which I used to get bud wood to top work a tree is doing very well. It is small tree you can see it in the picture. Even with all terminal buds removed the tree flowered and is now setting fruit very nicely, see pictures bellow. The top worked tree is growing very fast and should be a huge tree by fall. I had another little tree I grafted from the original I did not take terminal wood from it. It is flowering now. So far I can tell the tree likes it here, flowers well and can set fruit in abundance. Nishikawa is flowering late along with our late varieties and if it can hold the fruit fruit longer on the tree it can be a pleasant surprise for January-February. Update May 5, 2012. All the little trees dropped the fruit. Nature is smarted than my desire to taste it. The top worked tree is huge for a 3 month old graft. This tree is on its way to grow a lot this year. Up date June 20, 2012. I heard today from someone growing several of these trees in the Ft Myers area. Contrary of what is reported on some web sites, He reports that the fruit matures at the end of September-October. Big difference form January- February. The good news is that he tells me the taste is incredible, better than Hass, creamy and buttery. Up date June 23, 2012. 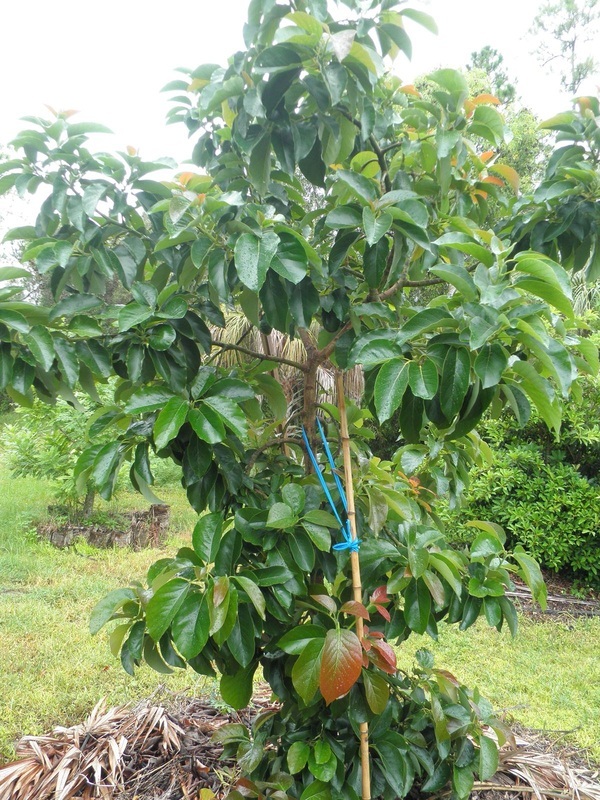 Heard from Berto also on the SW Florida reports that he has a 3 year old tree holding 12 avocados, See Pictures below. Also describes the fruit as: "The fruit has a nice firm texture and the flesh tastes buttery with a slight nutty flavor"
Up date November 21, 2012. My friend Berto send me two Nishikawa fruit, 24.4 and 21.8 oz. They look clean, decease free. I confirmed with Berto that he did not spray anything. It is encouraging to see clean late fruit specially after such a wet summer. See Pictures in album. Will report on taste. I asked Jon a friend in Hawaii and he indicates that they would star picking Nishikawas in Hawaii soon. So Florida may be ahead of Hawaii by a couple of week. Also he indicated the size of the fruit is about the same. Up date November 29. 2012. I got a detailed report with lots of pictures from Berto, very encouraging Click here to see it. Up date December 3, 2012. Finally my second Nishikawa was ready. Fortunately it was my birthday yesterday and I had lots of family home. So I was able to do a tasting. One of my daughters that likes avocados said it was the best avocado ever, so did her husband. My 15 year old grandson on that side of the family is an authority "eating" avocados. He can eat a two pounder all by himself, he said it was excellent. The other daughter, they don't eat anything with fat in it. Said she prefers the regular less intense flavor fruit. My own opinion is that is was creamy and tasty. One of my son-in-law said it reminded him of egg salad. To some extend I can see mashing the avocado, adding the ingredients of egg salad and eating it in a sandwich. Like every thing is a matter of taste, some will like it, others will prefer what they are familiar with. I will be incline to say that if you like avocados you will like the Nishikawa. On the issue of peeling: This was easy to peel is just that the skin is thicker than what we are familiar with. As result these are ready to eat I think just when they begin to get soft to the touch. Up Date March 28, 2013: My top worked tree is in full bloom, started to bloom about about two weeks ago and it seems to have another two weeks left. This is definitely a late variety I spotted a couple of small fruit. There are no flowers on top of the tree, it flushed vegetation, typical of the irregular first flowering after top working the tree. Seems like we could have some fruit out of this tree if it can hold it. April 20, 2013: This tree is just about finishing with the flowering just a few left. Seems like its going to set 6-10 fruit on its first year after top working it. Let's hope it holds it. The tree is healthy and beautiful. April 27, 2013: This tree is just about 99% done with the flowering. I was pleasantly surprised to see more fruit set this last week, all in the lower half of the tree. (typical of the first year of top working) I think we are headed for 10-15 pieces. I will be very happy if the tree can hold to maturity. May 22, 2013: The tree has dropped a few of the fruit and I think it would wind up with 4-5. The fruit looks very clean considering is across the Florida Hass whose fruit is full of scab damage. See today picture. Fruit is growing nice and fast. July 11, 2013: The Nishikawa is a big tree. A year and a half post top working and the tree is 15ft high. still holding a few fruit. See picture. November 18, 2013: I have been neglecting reporting on this tree. In the last two weeks there have been a mayor fruit drop I think this fruit needs to be picked in So. Florida before November 1. Starting to pick the larger fruits around the end of September and the season ends around Mid November. November 26, 2014: I did a dry weight test with the last fruit standing. Picked today and test done today. It came in a 23.93%, quite a bit lower than the 29.59% reported to reach in Hawaii. Let's hope next year the tree will be in better shape. For my work with dry weight. December 21, 2013: The tree is beginning to build flower buds in selective branches. April 4, 2014: The tree has been flowering for a while I see a few pea size fruit getting set. April 10, 2014: I had grafted a second tree about 14 month ago. Let's call it No 2. Is a nice size, and seems to be setting a lot of fruit, more than no. 1. It is facing south with no obstruction so is getting full sun all day long. See Picture. May 24, 2014: No fruit drop, both trees holding a decent amount of fruit. July 4, 2014: Some fruit dropped may be too many. The trees do not have a lot of fruit. Very disappointing. September 20, 2014: Just picked a 30 oz fruit from my largest tree. It only has 5-6 fruits, could carry 30-40, Let's see how it matures. October 11, 2014. The tree is dropping the little fruit it had seems to be doing it earlier than last year. Picked one fruit 30.9 oz to see how it ripens, looks clean. Evaluating the low production this year and the rot issues I have experience. I'm loosing interest and expectations on this variety, especially since this year the maturity as been the same as a Catalina and they taste very similar. October 23. 2014: The above picked beautiful fruit ripened ad it was full of rot inside. Worst than the others I picked earlier. See today's picture. My friend Rochard W. says that I let them get too big and I should pick around 20 oz or so, a lot earlier. We would have to wait to next year. Now the part that was good. The top 2-3 was actually very creamy. Had it for lunch and my wife said "Do you have more of these?" I think we have to give this tree one more year. But If I was looking to get it, If you are in Dade, I would wait. May 16, 2015: The two trees I have seem to have a decent amount of fruit. Seems like that tree alternates. Let's hope the quality of the fruit is better this year. June 13, 2015: The Nishikawa is holding a decent amount of fruit, Seems like a wide spreading tree. This year I'm going to start piking before last year. Probably in early September. July 16, 2015: Stopped by tree no 2. a smaller tree seems to have larger fruit. August 28, 2015: Both trees are leaded with fruit. I think I will pick one or two in Mid September to see how it ripens. September 14, 2015: I did pick a couple of fruit in the 28-30 oz size earlier in the months. It did ripen very well. 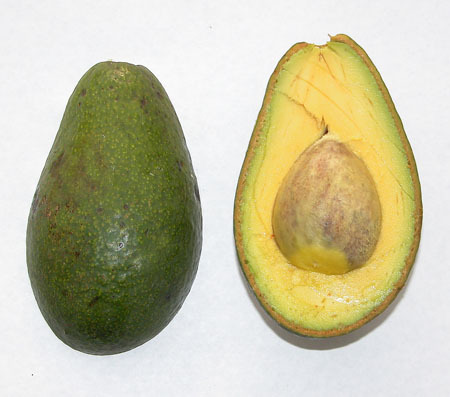 Excellent taste, creamy, a really outstanding avocado. Long shelf live take 10 days to get soft at room temperature.It peeled fine, but it has a hard shell-like skin, if you allow it to get too soft the inside will the over ripe. See Today's Picture. September 22, 2015: Nishikawa is having a good year. The southern tree in full sun is a two year old since top worked has a lot of fruit on. Growing very well, ready to pick. See today's pics. September 29, 2015: Apparently these fruits need more time. They are not ripening evenly and as in previous years the is a lot of post harvest disease that I do not understand much. I know other people growing this and they do not get it. Can be that in avocado country this tree may be susceptible to stuff that is in the air. See today's pictures. October 22, 2015: The post harvest disease on the picture of September 29, has been identified as a form of antracnosis Colletotrichum gloeosporiodes. Nasty as its name. Today I notice a lot of fruit on the ground at least in my grove this is an October fruit. I have some fruit and I have treated post harvest soaking them for 20 minutes in a solution of 10 ml per gallon of Mangabond, a copper fungicide, 100 liquid and a clear product. This fruit is to tasty not to try something to eat them. November 15, 2015: Compare today's pictures to the ones of September 29, 2015. Today's picture have been ripening in my kitchen for 10 days now in perfect condition. These were dipped in a new post harvest fungicide. They are eating perfectly no sign of disease, ripening evenly. For those Catalina fan this fruit is paradise, is a Catalina to the 3rd power and comes in after the Catalina is finished. 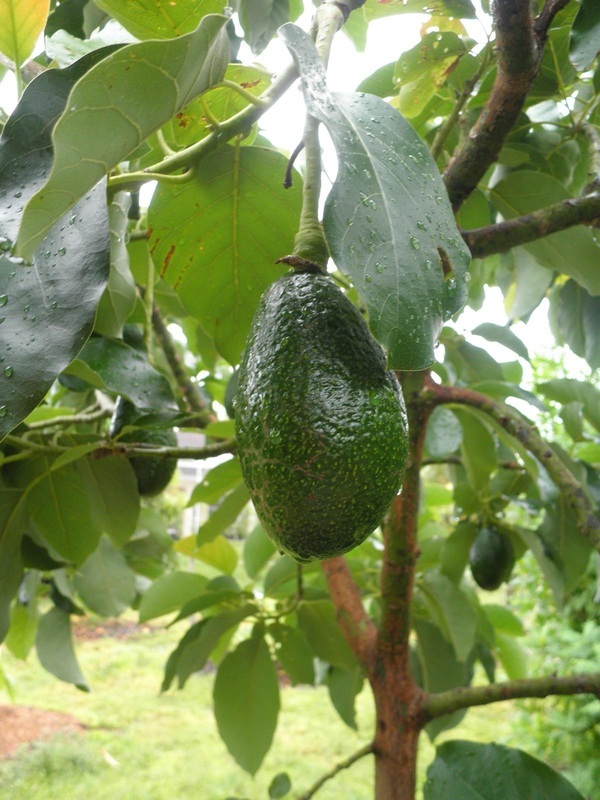 This confirmed my suspicion that some of these issues were post harvest, to the average person far from commercial avocado groves you probably grow this variety OK. If you are a Catalina fan, definitely make room.